Start low and progress slowly – if on the first day you work out excessively, all your muscles will hurt, and you may not have the strength to continue steadily! Increase the weights & exercises over the course of the month. Mix It Up – create a balanced routine with different activities – keep yourself entertained by mixing the exercises. If you are at the gym, choose between the treadmill, the stationary bike, squats, jumping jacks, or weight machines. On a different day you can take your exercise outside and walk for 30 to 45 minutes. Do It For Yourself – in order to stick with your fitness routine, you need to choose to do it out of love for yourself, and a genuine desire to live a healthy lifestyle. You come first. Hang tough! – who said it is easy? But that does not mean you have to quit, right? If you already have a fitness routine, then you are aware of the benefits and side effects that come along with it, such as: feelings of happiness, accomplishment, strength, fulfillment, just to name a few! Put It On Paper – keep track of your progress! I always write down whether I attended a fitness class (and which one it was), spent an hour jogging outside, etc. Select A Convenient Location – I have always focused on this one because I like to make it easy on myself to ensure that I later attend the classes!! ** Thanks Ellie Activewear for making this post possible. 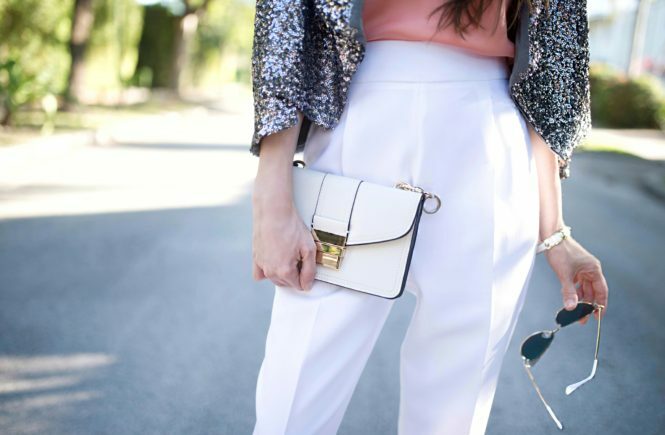 How to Style a Sequin Cape Blazer!